The shaking beef’s precision-diced cubes of filet mignon are supremely tender. Given its location and floor plan, this former Starbucks on the ground floor of a giant apartment building could have been yet another bland outpost of corporate food culture, a place to grab a smoothie or a poké bowl. What happened instead is an intensely personal vision of Vietnam, blending past and present. With the exception of the glamorous Le Fat in West Midtown, Atlanta’s Vietnamese restaurants are mostly holes-in-the-wall serving pho or sprawling family places that address the needs of their own community. Anh’s Kitchen is something different: a sophisticated, intimate concept defined by the authenticity of its ingredient-driven kitchen and its hip sense of design. Wife-husband duo Duc Minh Nguyen and Duc Minh Thanh run the kitchen. Drawing on her Vietnamese heritage and working on a shoestring budget, Tramanh Nguyen (who, with her husband, co-owns MF Sushi and MF Bar) brought on notable restaurateur Alex Kinjo to design the space and help launch the concept. Duc Minh Nguyen, a chef and former restaurant owner from Saigon, runs the kitchen along with her husband, Duc Minh Thanh, also a chef. The two chefs previously worked in California. Shaking beef, a wok-seared dish inherited from the French, is often a marker of luxury in Vietnamese kitchens, yet it can be problematic. Use the wrong cut, or saute it a split second too long, and it is a major disappointment. At Anh’s, the precision-diced cubes of filet mignon are supremely tender, juices sealed in, glossed with a thin, white, onion-lime sauce. Plated on peppery Sausalito watercress, it is a miracle of delicacy and richness. 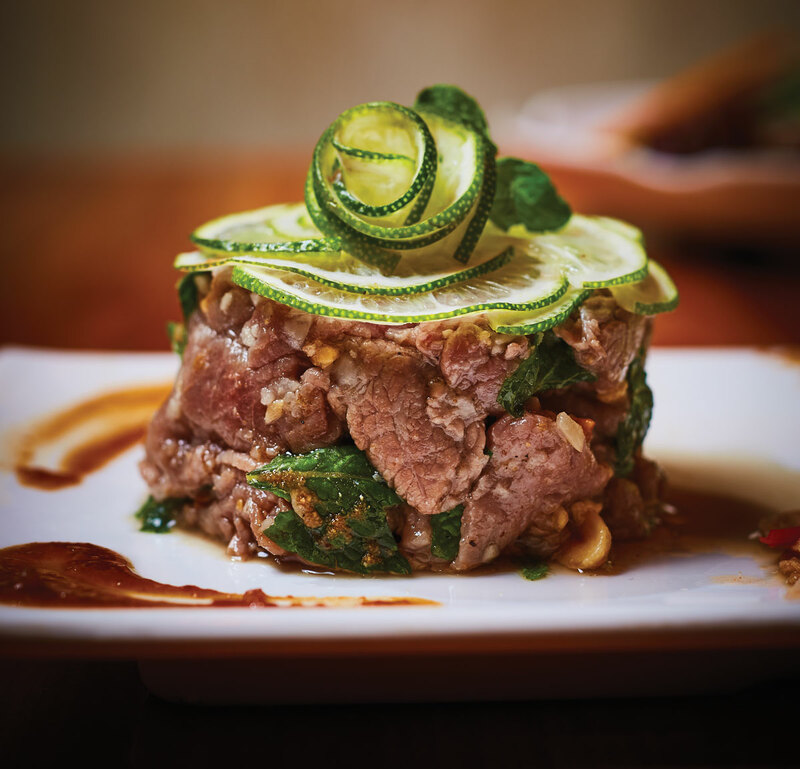 Thinly sliced beef carpaccio, mounded in the shape of a little cake, is punctuated with crushed peanuts and torn cilantro and is equally delightful. In various homemade sauces, notes of sesame, black pepper, hot chilies, light fish sauce, and soy recombine in ingenious ways. The sticky fish sauce wings, the grilled whole chicken leg, and the smooth lotus root salad are all original in taste and textural wonderment. Stop by the counter for a restorative bowl of pho with filet mignon, brisket, and meatballs swimming in strong broth. Or feast at a table loaded with grilled sausage spring rolls, shredded chicken salad with cabbage and onion, and caramelized wild Gulf shrimp served in a clay pot. The restaurant doesn’t have a liquor license, so you’ll have to BYOB or make do with a tall glass of Vietnamese iced coffee with sweetened condensed milk. Shades of orange spread warmth throughout the restaurant, from walls splashed with bright burnt-orange paint to coffee cans of Cafe du Monde holding yellow-orange chopsticks. Even the tables have smooth wooden tops with a golden tinge. The plan is for the front room to include a grab-and-go window facing Peachtree, and while the tables plopped in the narrow corridor that leads away from the dining room proper may feel like Siberia to you, this adjunct space is a great hideout for those who seek intimacy. 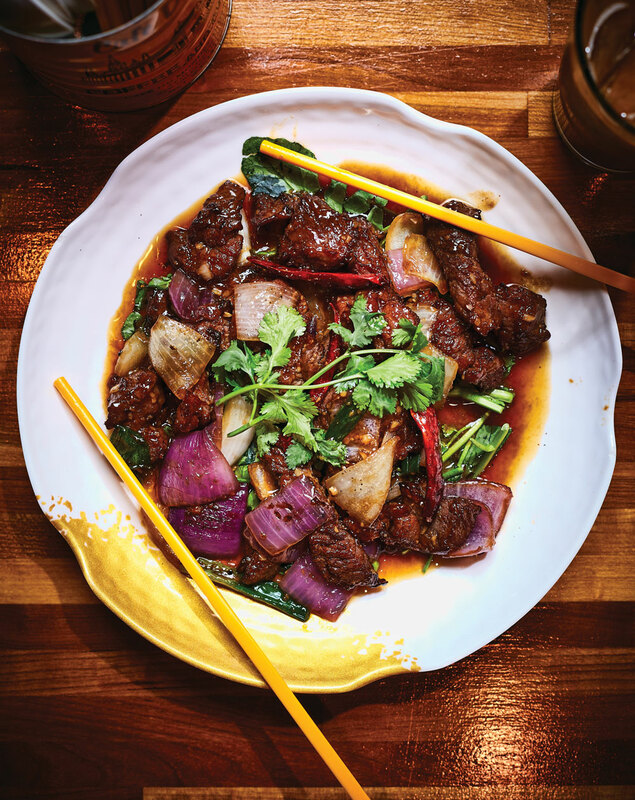 Faithful to the flavors of Vietnam yet ambitious in the composition of dishes prepared by an experienced team, Anh’s Kitchen is that rare sight in Midtown: an independent restaurant of unusual sophistication.